I’ve never been a fan of Apple’s Application Switcher, mainly because it requires holding down the Command+Tab keys in order to use it. Instead, I use the Keyboard Maestro’s powerful Active Application Switcher. 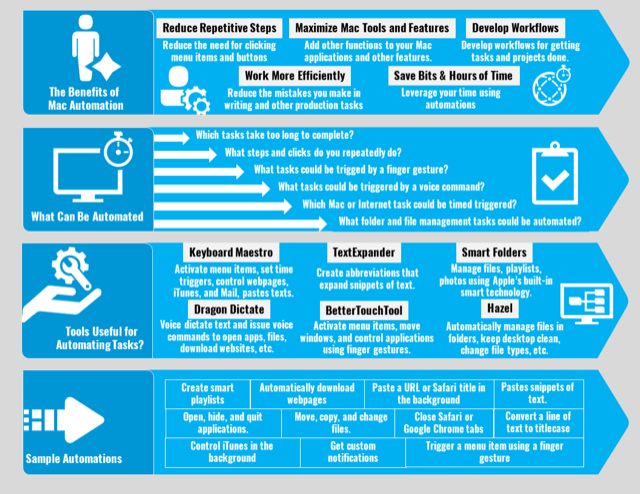 When you have several applications open at the same time, it can sometimes be a hassle to locate and switch between applications buried behind one another. 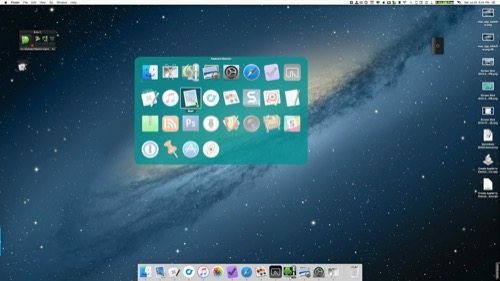 When you activate Apple’s Application Switcher, you need to keep you thumb on the Command key to keep it active, and from there you can tab forward to select an application. You can also use hotkeys like, Command+T+Q to quit a selected application, or +H to hide a selection. But the KM Active Application Switcher offers more. 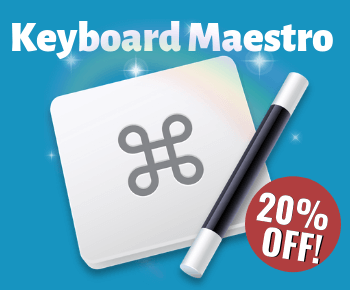 Note: here’s an introduction to Keyboard Maestro, if you’re not familiar with the program. Update: Here’s a video version of this article. The KM Switcher can be assigned a custom hotkey to trigger. But if you map that hotkey to a BetterTouchTool finger gesture, you don’t have to hold down the hotkey to keep the switcher open. It remains open until you make a selection. More about this in the next section. The Switcher also allows many more hotkey actions to be used on selected applications. Press “q” to mark (or unmark) an application to be quit. Press “k” twice to mark an application to be force quit. Press “s” or “h” to mark (or unmark) an application to be hidden. Press “l” or “z” to mark (or unmark) an application to be launched. Press “a” to hide (or show) “always included” applications. Press “e” to show (or hide) “always ignored” applications. Press “j” to show (or hide) “recently quit” applications. Press “c” to select the current application. Press “f” to select the Finder. Press “d” to switch directly to the current application and hide other applications. Press “i” to Get Info on the current application. Press “r” to reveal the current application in the Finder. To use the KM Switcher, create a new macro and add the Active Application Switcher action. 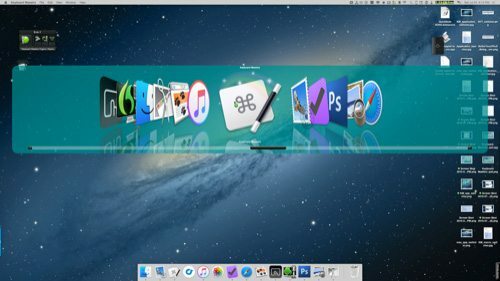 Notice that you have several customization options for the size and color of the grid, and which applications you want to appear in the display —including applications that are not currently running. 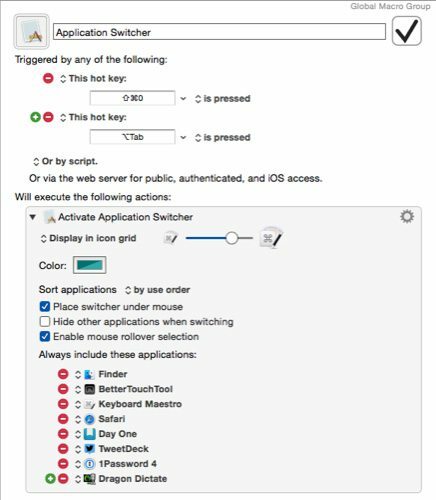 There are no options like these for the Mac Application Switcher. You can can assign a custom hotkey to activate the Switcher. Personally I don’t use hotkey. Instead, I have the macro mapped to a BetterTouchTool finger gesture action, because normally when I’m switching applications, my hand is already on the trackpad. 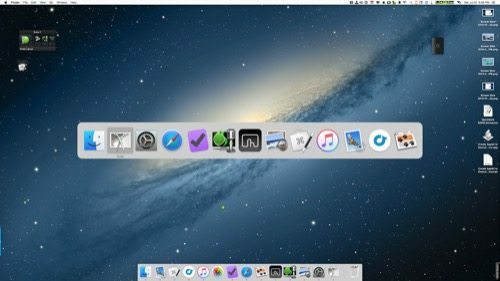 Some Mac power user prefer to use Alfred or LaunchBar to activate and switch to different applications. I can certainly see how those applications are particularly useful for people who like to keep their hands on the keyboard. But you can also add a stringer trigger to the Switcher macro and activate it that way as you type. 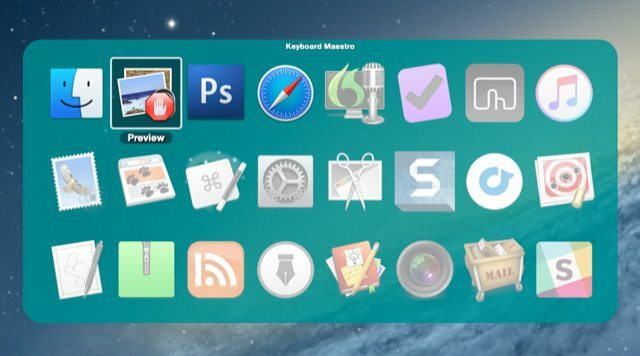 Keyboard Maestro also includes an Application Launcher action, which works similar to the Switcher, but its display is different. 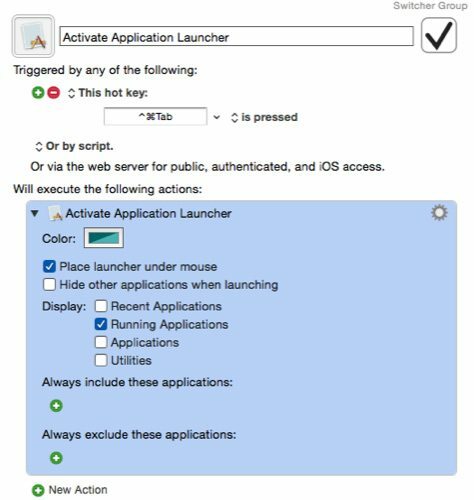 You probably won’t want to enable all your applications and utilities in the launcher action, because it would clutter the display. But the Launcher might be useful for viewing recent and running applications. 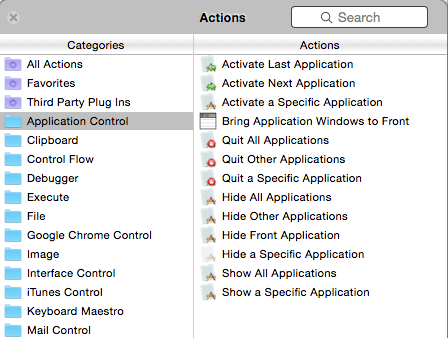 There are other application related actions in Keyboard Maestro that should check in the Application Control folder under the Actions Categories. I will cover those in a future blog post. 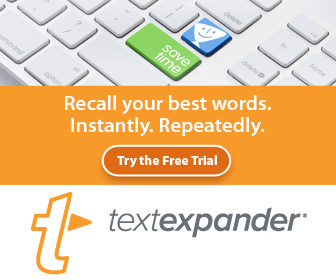 You might also be interested in SuperTab which is a powerful launcher that can be activated using a hotkey, or by pointing the mouse to a specified corner of your desktop. 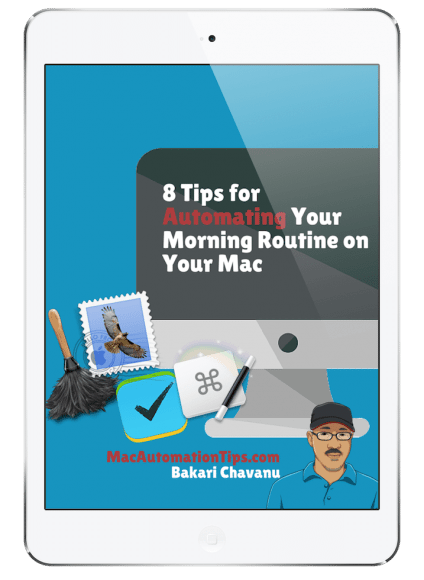 It includes tons of other features that you might find handy. Let me know what you think of the application switcher for Keyboard Maestro. If you have any tips for how you’re using the Switcher, please share them in the comment section below. If you’re new to Keyboard Maestro, I would also like to hear from you about your experiences with the application so far. I guess I’m confused. I set mine up exactly as yours, and while my BTT gesture did activate the switcher, I wasn’t able to take any action with it. It simply sat on top of my other open app windows. Also, could you clarify why you feel this is better than the native switcher? If you have to keep the command key pressed, how is it that much different from the native switcher keystrokes? Hi Steven, I’m not sure what you mean by you’re not able “take any action with it.” Unlike the native app, the KM switcher doesn’t require you to keep the Command key pressed down. It stays active until you click something using your cursor. 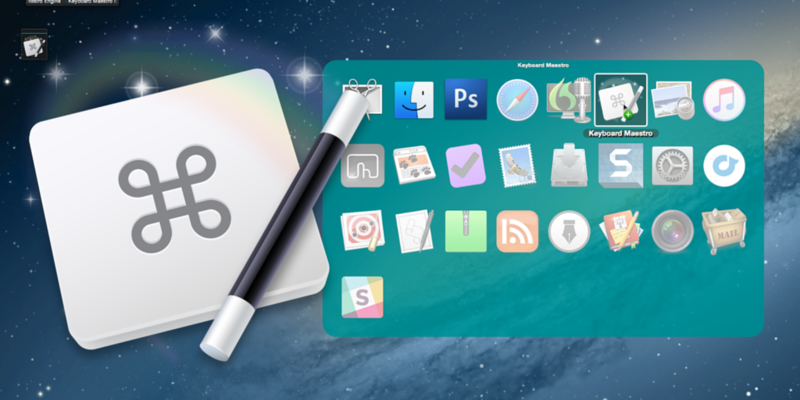 The KM switcher also lets you add apps not in your Dock. Those are the two main reason I find it better. Thanks Micheal, I’ll update the post to include that.